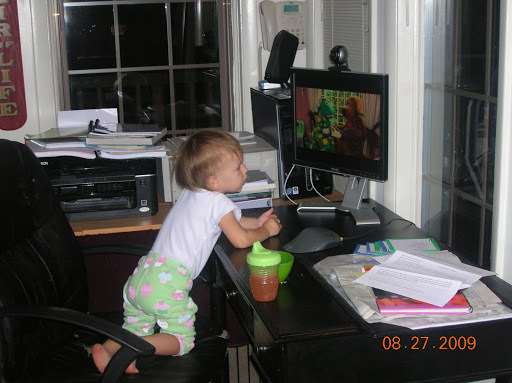 Once she learned that certain shows could be viewed from my computer, she began demanding to watch the moment she woke up. She doesn’t care that there are emails from Daddy waiting to be read. It’s OK. I’m forcing myself to pray and read first thing in the morning. As an aside, my oldest son was also an early riser…and I mean early: before 5 AM and raring to go, just like Mary. I remember hearing the sage advice of an experienced mom saying that mothers needed to get up at least a half hour before their children to have some personal time. She, obviously, did not have really early risers. I am an early riser, but I draw the line at 5 AM. I think it is unreasonable for anyone to be expected to get up before then, and my advice to mothers in that position is to have patience and teach your toddler his numbers as soon as possible. When he can identify the number 6, get him a digital clock for his bedroom and forbid him to come out until the first number is a 6. There is hope; you just have to wait three years and pray the next baby likes to sleep late. After she gets bored with “See Tee” – which I think means “See TV” – she wants “bubbles” in the sink. She makes a mess, but at least I get time to read the latest love note from hubby. 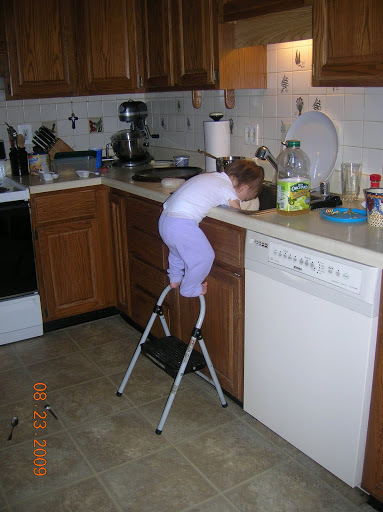 Usually she stands on the step, but she recently learned that she could get higher by standing on the handle. And she has learned that she can continue onto the counter this way. After 6 kids, I’ve seen it all, but that doesn’t make me much calmer when I look over and see her sitting 42″ off the ground. Oh, she is rotten, adorably rotten! I'm getting heart palpitations just looking at the photo of her standing on the stool like that!! I'm with Marie, you must get quite the adrenaline rush in the morning, yikes! That reminds me of a woman I knew back when my oldest was a toddler. She had a sunken family room open to her eat-in kitchen. The kitchen table was “above” the family room couch and her tot would climb on a kitchen chair, to the table, and then jump onto the couch – had to be a good 3 1/2 to 4 foot drop. She was used to it, but I just about died when I saw it. You might just want to get a dollar-store dishpan, set it on a towel on the floor, and let her “play bubbles” in there. She can “wash” all your tupperware or her own sippy cups.